The days are getting warming, which means it will soon be popsicle weather! My children are hit or miss on eating applesauce but they love it in frozen form. This recipe is so easy to make and delicious! While you could use applesauce from a jar to make this in one step, fresh applesauce is worth the little bit of effort that it takes! 2. Place in Instant Pot along with the water and cinnamon. Cook on manual mode high pressure for 10 minutes, use a quick release. Alternatively, simmer on the stovetop until apples are mushy and easy to blend. 3. 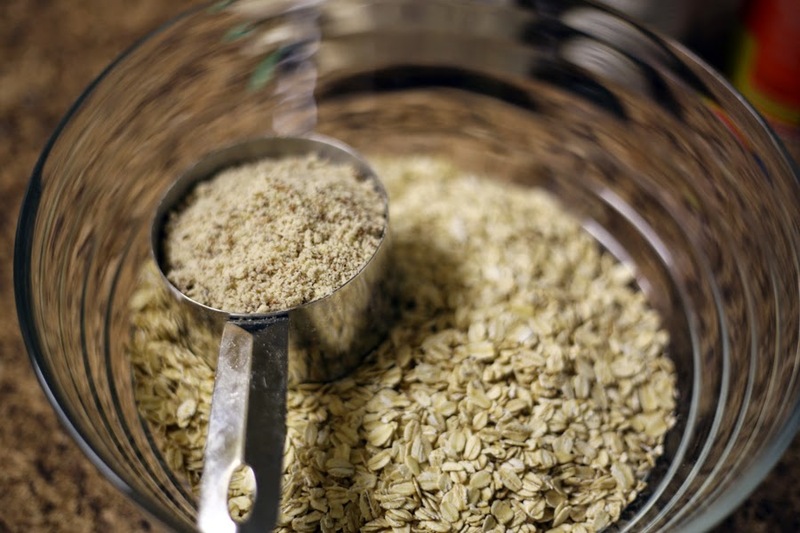 Use a blender or immersion blender to mix until smooth. Add the raspberries and mix until they are blended as well. 4. Allow to cool, pour into popsicle molds. 5. Freeze for a few hours if you want it to be slushy or overnight for a hard popsicle. These chicken burgers are adapted from the salmon cake recipe that you can find in the book "It Starts With Food" by Dallas and Melissa Hartwig. I'm not the biggest salmon fan, but I do like a quick meal that works well for breakfast, lunch, dinner, or best of all: brunch! With a fork, stir the eggs in a large bowl until there is a bit of air mixed in with them. Mix the rest of the ingredients in and combine. Grease cookie sheet with oil or ghee. Scoop out with 1/3 cup measuring spoon onto cookie sheet and shape into patties. Bake for 20minutes, then rotate pan (flip them if you feel ambitious). Bake for another 10minutes. Serve hot in a lettuce wrap with mustard or stick in your fridge to grab and go throughout the week! So I've been slacking here for awhile. Life gets busy! And I haven't had much time to go out to brunch lately. Well, that's not completely true. I did have a lovely brunch at Fare in the Fairmount section of Philly recently. I ordered a basic scrambled eggs, bacon and hash browns --the hash browns were nicely done, not overly fried and almost like a scalloped potato. A brunchmate ordered the fish tacos, and after a bite I wished I had done the same. They were delicious with a lovely citrus slaw. It was not an overly crowded spot and the meal and company were delightful. Apologies for the lack of photos from our meal. You should check it out and post your own photos from Fare in the comments below! Shrimp & grits are a total brunch comfort food, perfect for those chilly autumn mornings. I've had this dish at a number of brunch spots, but decided to try and make my own at home. 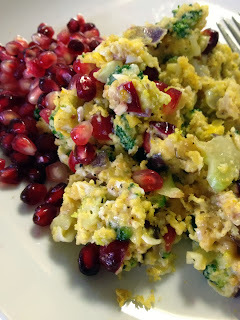 It's really easy to make and like the best brunch foods, good at any time of the day! Add salt & pepper to water and bring to a boil. Add in grits, turn heat to low, and stir to prevent lumps. While the grits are cooking, heat oil and cook garlic & onion until they start to brown. Add in lemon juice & broccoli. Add in shrimp. Cook over a medium heat until broccoli is tender & shrimp is fully heated. Once grits are cooked, turn off heat and add in the butter and cheese. Stir to combine. 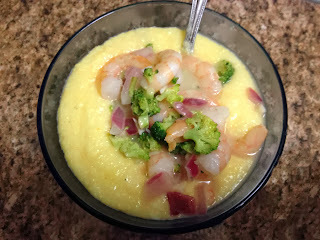 Pour grits into 4 bowls and top with shrimp mixture. Serve at once. Farmers markets are wonderful things. The produce always lasts longer because it hasn't had to travel across the country and sit on a pallet before reaching you. The produce is always in season. Sometimes you run into a neighbor or friend. But my favorite thing about farmers markets is discovering new foods. Today I discovered duck eggs. The stand I was planning to buy chicken eggs from had run out, but they still had some duck eggs. A bit unsure of what to expect, I decided to take the plunge and try them! The people from Canter Hill Farm assured me that they were delicious -- richer than chicken eggs and good for baking. They were right. I just made the most delicious, rich, amazing duck egg scramble. But don't take my word for it, try the recipe for yourself! Heat oil in frying pan over medium heat. Add onions, and stir until they start to slightly brown. Lower heat a little. Add the broccoli, and continue stirring. Add in cranberries. Once the broccoli starts to tenderizer, push the veggie mixture to one side of the pan. Crack the 3 duck eggs in the space you created. Stir the eggs until it starts to be cooked. Add lemon pepper to egg mixture. Once eggs are almost cooked, blend with everything else. Once eggs are fully cooked, add the cheese and mix in to melt. Stir everything together over low heat for a few more seconds, and serve immediately with fresh fruit. 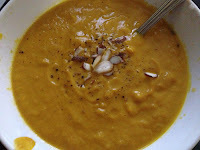 Before dining at Tapas on Main in Bethlehem, PA, I had never heard of Caramelized Pear and Carrot Soup. But it was so delicious that I had to try to make it myself! Well I did, and a brunchmate who "doesn't eat soup" just inquired, "is there any more?" Heat oil in skillet over medium heat. Add in onions and cook until they start to caramelize. If using sausage, add it in now. Chop the pear into large chunks and add to pan. Cook until pear starts to soften & becomes juicy. Break carrots into smaller pieces and add, turning off heat so they do not really cook yet. In high speed blender (Vitamix is ideal), pour in vegetable broth. Then add in the pears, carrots, and onions. Retain approximately 1 tablespoon of the onions and the sausage. If your Vitamix has a soup setting, run it on that. If not, then run mixture until smooth & creamy. Once done, carefully remove lid and add in a dash more of salt to taste, the remaining onions, and the sausage. Pulse on low for about 10 seconds to combine. If you've used the soup setting on Vitamix, pour into bowls and serve. Otherwise heat over stove and then serve. Top with ground pepper & almonds. A sweet springtime soup that's sure to please! For a summertime meal it probably would also taste good as a chilled soup topped with Crème fraîche!